I’ve only read one Kurt Vonnegut book before this one, Slaughter-House Five, though I’ve stayed interested in his work ever since I’ve read that book. It’s probably been four or five years since I read my first Vonnegut but the man is a fascinating character in his own right (and no, I’m not making reference to Kilgore Trout but the reference is there if you want it). Several months ago I went to a bookstore with the intent of buying another Vonnegut book. This is my kind of writer and I owe it to myself to explore his oeuvre. I couldn’t pick out a single book and after arriving at a shortlist of three books, I asked my wife to pick. She singled out Galapagos and, here we are, a few months later with a review about humanity’s destruction and rebirth as a new species. Simply put, Galapagos is an evolutionary journey recounted from the point of view of a million years in our future. There and then, the ghost of a man from the 20th century is telling the story of the crisis which befell humanity in 1986 and how unusual circumstances made the Galapagos Islands the hotbed of evolution for a second time in the history of the world. It’s on one of its volcanic islands that the last survivors of humanity find themselves the originators of the next step in human evolution. In terms of narrative the book doesn’t do very well. It’s choppy and jumps all over and follows what at first appears to be tangent but later is revealed to be the whole point of the book. Galapagos is the origin of a new species of man, furry dolphin hybrids with flippers and small teeth. A million years in our future we’ve been completely transformed and instead of stomping around, deluding ourselves with the idea that we’re masters of our planet, we’re splashing around in the South Pacific prey to great white sharks and orca whales. The novel’s narrative focus is on establishing the conditions of humanity’s downfall. As for structure, it doesn’t follow a typical novel structure, which makes sense since nothing about this book, content, plot or structure is typical. The book isn’t broken down in acts. The end of the story isn’t a secret and the story’s “end” is revealed pretty early on. There is no real tension or narrative momentum. Rather Vonnegut and the narrator skip around and focus on characters and ideas more than on plot. The book follows characters, linking them together, jumping from one to another based on the events in their lives that connect them. You could make a very interesting spider diagram linking together all the characters and it might even shed some light as to why Vonnegut jumped around as he did. Additionally, these connections between characters hint at the fact that humanity is a species and individual actions have repercussions on all of human kind. Where this book excels is in its satirist and nihilist voice. The contempt for modern civilization is palpable and Vonnegut expresses himself in a way that isn’t bitter. Instead, he comes off as wise and hilarious. As satire, this book is excellent. As a self-deprecating comedy, it’s also excellent. As the title suggests, his approach to poking fun at modern man is done from the point of view of genetics and natural selection. Numerous references are made to the idiocy of mankind’s overdeveloped brains. They’re the cause of most of humanity’s problems, many of which still make headlines today. The most important one mentioned in the book is the mistreatment of others for personal benefit. 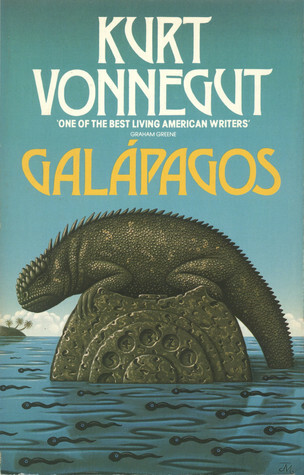 Galapagos is an unusual book but it succeeds by staying true to its concept and seeing it to the end. The book is hilarious and quick, making it a gripping read. The story of humanity’s self-destruction being avoided by pure chance and coincidence makes for a unique kind of cautionary tale. 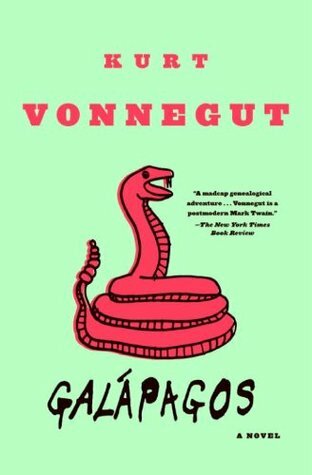 This book breaks the rules and curious readers will be rewarded with a huge amount of ideas, skilfully executed by Vonnegut. With this novel he proves that he’s a master of the written word by avoiding conventional stories and conventionally storytelling. As long as you don’t pick up this book expecting something familiar, you’re such to delight in this post-modern Darwinian tale.